Exports the information in a textual, comma-delimited format. 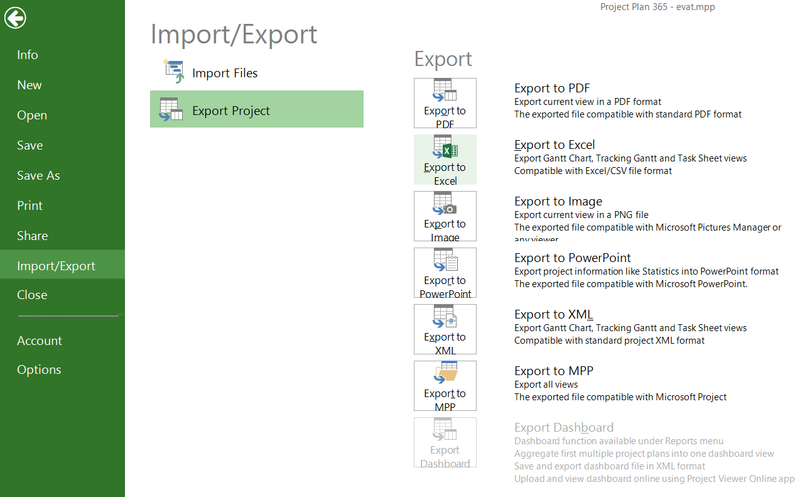 The exported file can be opened in Microsoft® Excel or any text editor. This format exports the task or resource information in raw table format, with no formatting or outline information. It is available for Gantt Chart, Tracking Gantt and Task Sheet views. By using this option, the content of the list of tasks will be exported in a CSV format. 5.In folder explorer type the name you want in the File name box or leva the auto generated name, and click Save. - this command will create sample.csv file in c:\my files folder. set PV="C:\Program Files (x86)\Viewer Central\ProjectViewer365\ProjectViewer.exe"
cmd /c "%PV% /csv %1"
 These steps are only available on Project Plan 365 for Win PC/Server.